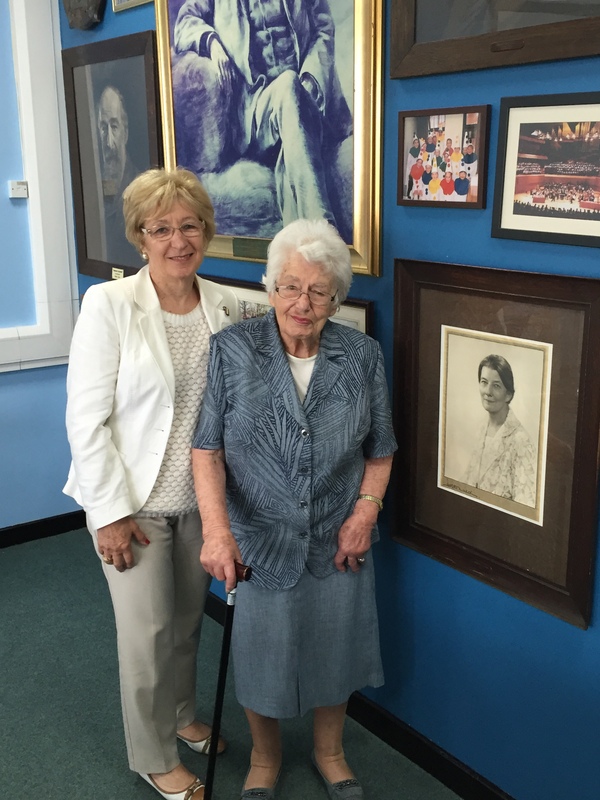 Yesterday we had a very special visit from 100 year old WGS Alumna Vera Cohen and her daughter Erica Abrahams (nee Cohen, Class of 1967). 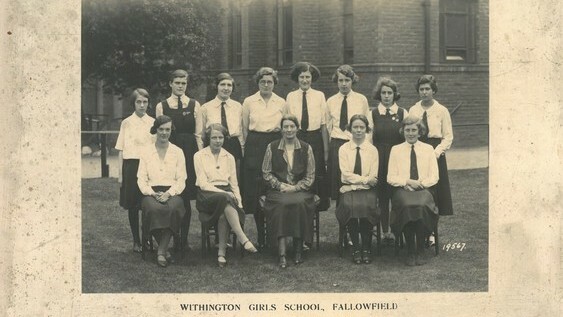 Vera, who left Withington in 1934, had some great stories about the school under the headship of Miss Grant, who she said was a very kind and gentle woman. Vera told us how she had loved playing sports every day when she’d been at school, including lacrosse, hockey, tennis and cricket. Her team had won the Tennis Shield whilst she’d played with them, and she recalls Miss Grant coming to watch the final match which won them the prize. In lacrosse she favoured the position of goal keeper, which she described as a ‘family-trait’, as this was also the preferred position of her two younger sisters, Olga and Marcelle. 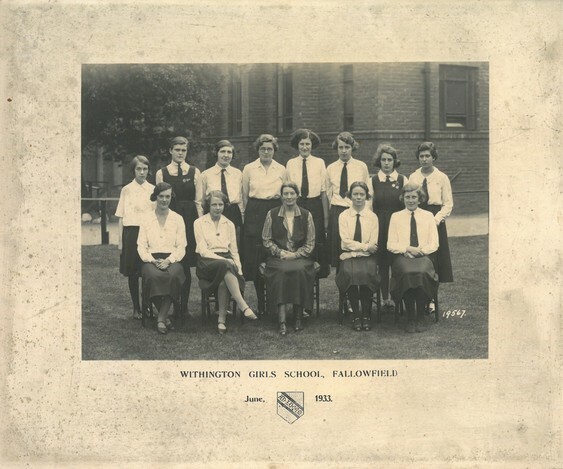 Vera recalls the friendly but often tense rivalry between Withington and the neighbouring Manchester High School, and said that the matches they played against one another were seen as the biggest of the year by the pupils. She even likened the dynamic between WGS and MHSG to that of Manchester United and Manchester City! Vera’s passion for sports was clear as she relived these memories, and when asked about her favourite academic subject in school she said, ‘None, I couldn’t wait for lessons to end so that I could go outside for games’! Vera shared many other stories about her experience at school, which in her time had been much smaller than it is today, with no more than 300 pupils. She told us of the ‘three shoe bags’ that Withington girls had to carry around- one each for indoor, outdoor and gym shoes. On her first day at Withington, Vera opened the bag which was supposed to contain her indoor shoes, only to find a bag full of newly darned socks! She also remembered how her school tunic wasn’t ready in time for her first day, so she’d had to make do with a navy dress with red piping. Although remembering a school completely different to the Withington we know today, Vera stressed how happy her time as a pupil had been. Erica too enjoyed her time here when she came in later years. Like her mother she had also loved sport, but favoured netball over lacrosse. Both recalled how they had cried on their final day of Sixth Form at the prospect of leaving Withington. Our Archivist, Hannah Brown, had kindly prepared some photos of Vera and Erica’s time at school and Vera spotted herself in a photo from 1933, naming a number of the other girls she could still remember too. These days, Vera spends much of her time baking Middle-Eastern cakes and selling them to raise money for The Christie, a charity she has been supporting since she was 86 years old. In that time she has raised more than £18,000, and even hosted her 100th birthday party in March in aid of the cause, asking guests to donate money in lieu of presents. She still lives in Didsbury, in the area she has lived all her life. Vera is a huge fan of Manchester City, and has attended their games regularly for 80 years. She recalls how, during her school years, she used to be able to hear the matches going on when the football team had been based nearby at their Maine Road stadium. Although Withington is now virtually unrecognisable to how it was in Vera’s day, both her and Erica seemed delighted to return, commenting on the lovely front entrance and the impressive Founders’ Room display. It was great to spend time chatting to both Vera and Erica about their Withington memories, and we’re so glad they were able to pay us a visit! A class photo from 1933. Vera is on the back row, second from the right.